This cleverly designed apex shed lets you make the most of the space it provides, thanks to its centrally located double doors. The wide opening provided by them makes it easy to move any object in and out, whatever their size or shape, making it a versatile and useful addition to any garden. Longevity is another key benefit of this shed, as indicated by the 15 year guarantee against rot provided by the manufacturer. Their confidence in the shed seems well founded, with solid sheet flooring and roofing allied to thick overlap cladding. Even in heavy rain or snow, water will simply bounce off the surfaces of the shed or be carried harmlessly away, keeping the contents inside safe, dry, and secure. Because the manufacturer’s guarantee doesn’t stipulate that annual preservative treatment is required, owners of this shed can save significant money and time over the 15 year period. We would still, however, recommend that the shed is inspected every year and that further coats of wood preserver are applied if they seem to be required. 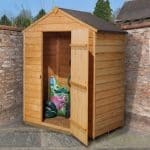 Overall, this is a good looking shed that offers great storage potential, and yet it’s available for just a little over two hundred pounds. This shed features a classic overlap cladding design with an apex roof. Both of these features prove very useful when it comes to combatting the heavy rain which our country is often subjected to. 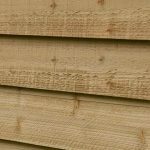 Rain simply bounces off when it hits the surface, and this proves highly effective when it comes to protecting both the timbers and the contents kept within the shed. The apex roof also provides extra room in what was already a very spacious shed. The roof itself is made of solid sheet material, which is tough and durable when covered with the green mineral roofing felt provided. The ridge height of the roof is a tall 2.13m and the eaves height is 1.51m. The door opening of the shed is 1.66m high and 1.10m wide, so there are no problems getting in and out. Including the overhang, this shed has a depth of 1.55m, and a width of 2.16m. When we review a big shed such as this with an overlap cladded exterior our first concern is whether the cladding is thick and strong, or whether the structure as a whole will feel a little flimsy. At 8mm thick, the overlap cladding on this shed feels sturdy and it also helps to keep the interior warm when the temperature drops outside. The shed’s frame is a standard 28mm square, and the floor is made of solid material OSB and has a thickness of 10mm. 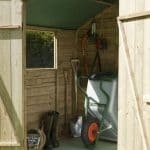 This makes it suitable for bearing the weight of most gardening material, but if you plan to store heavy machinery in the shed it may be necessary to reinforce the floor. One useful feature of the floor is that the joists are pressure treated just like the walls are, protecting them from rot which could otherwise occur due to rising moisture from the ground. 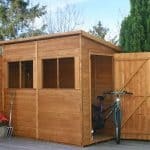 When we review a shed one of the most important things we look for is a long lasting protection, especially one which gives the consumer added value by not requiring yearly retreatments. We’re pleased to say that this is just what this shed delivers. The pressure treatment that the timbers and floor joists are subjected to, ensures that the preservative gets deep into the heart of the wood rather than staying on or near the surface. This makes it much longer lasting than brush or dip applied wood preserver, and is the basis upon which Shed-Plus can offer a 15 year anti-rot guarantee. 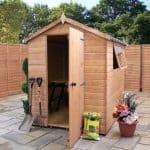 No further treatment is required by the owner under the conditions of the guarantee, but due to vagaries in the weather we would always advise shed owners to inspect their shed on a yearly basis and be prepared to re-treat if required. We were struck instantly by the doors of this shed, after all it’s unusual to find double doors on a shed of this price. They are easy to open and yet feel reassuringly solid, being double hinged on both sides. When fully open they create an opening of more than a metre in width. 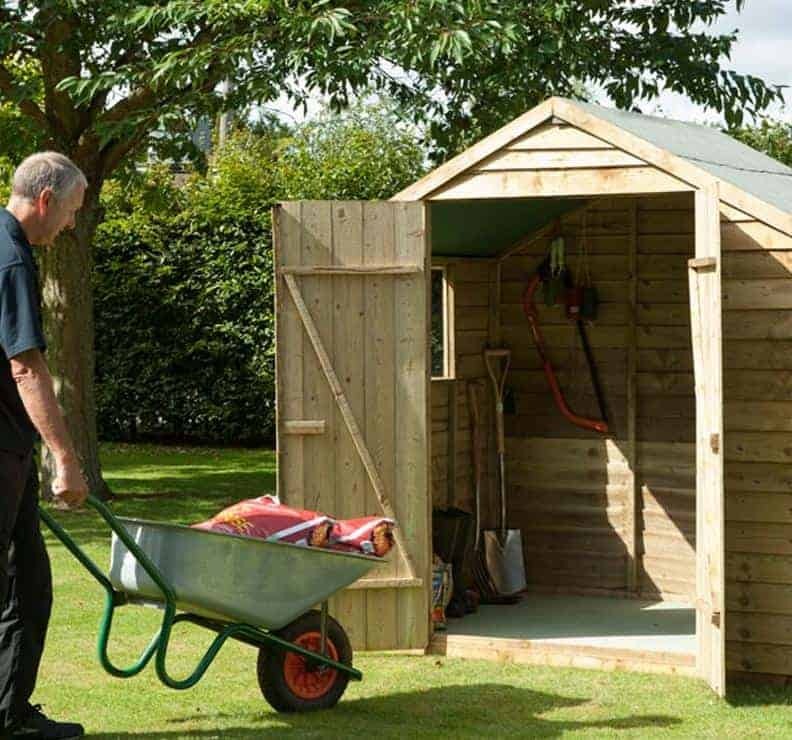 This means that as well as lawn mowers and garden tools, the shed could be used as all weather storage for items such as motorcycles and scooters. There is one fixed position window on this shed, and it measures 0.5m X 0.59m. Positioned on one side (the side panels are interchangeable allowing you to choose the side which is best for your particular garden) just below the roof level, the window is perfectly sized in that it allows a good amount of light in while not allowing passers by to see inside too easily. The double doors come equipped with solid hasp and staple fastenings, yet no padlock is included. The wide opening could attract opportune thieves, so we highly recommend buying and fitting padlocks and possibly a chain system. 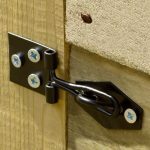 The window, however, is made of styrene which is tough and designed to be shatter resistant, so this is a useful safety and security feature for your shed. There’s a lot to like about this shed, but our first concern after viewing it was that the double doors could attract interest from criminals without there being an adequate locking system as standard. This is easily remedied, however, as kits containing a padlock and security alarm can be purchased for less than twenty pounds. 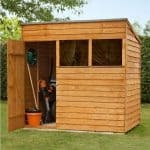 A 7’ X 5’ self assembly base kit is also available for this shed. It’s quick and simple to construct and provides a firm and flat base for the shed itself. The principal advantage of using this base kit is that it reduces ground contact, thus increasing the life expectancy of the shed’s flooring. A final accessory is available in the form of a solar light. This light absorbs the sun’s rays during the day, and when switched on in darker conditions you’ll be impressed by how much light it emits. 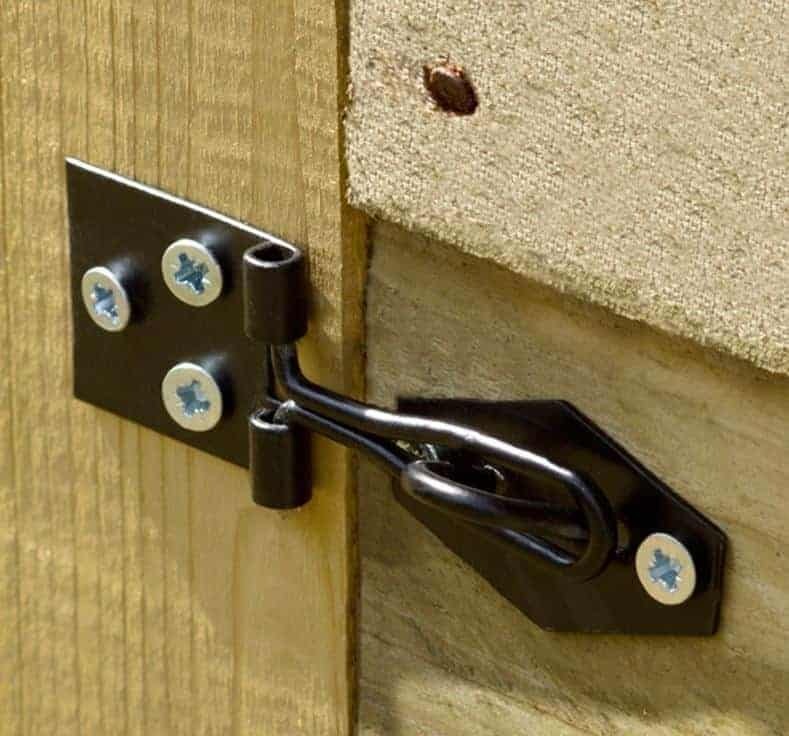 This can be used as a further security feature, or simply to light up your entrance into the shed at night. 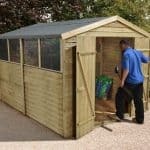 Shed-Plus put quality as their main priority, and that’s instantly noticeable with this high quality and good looking shed. 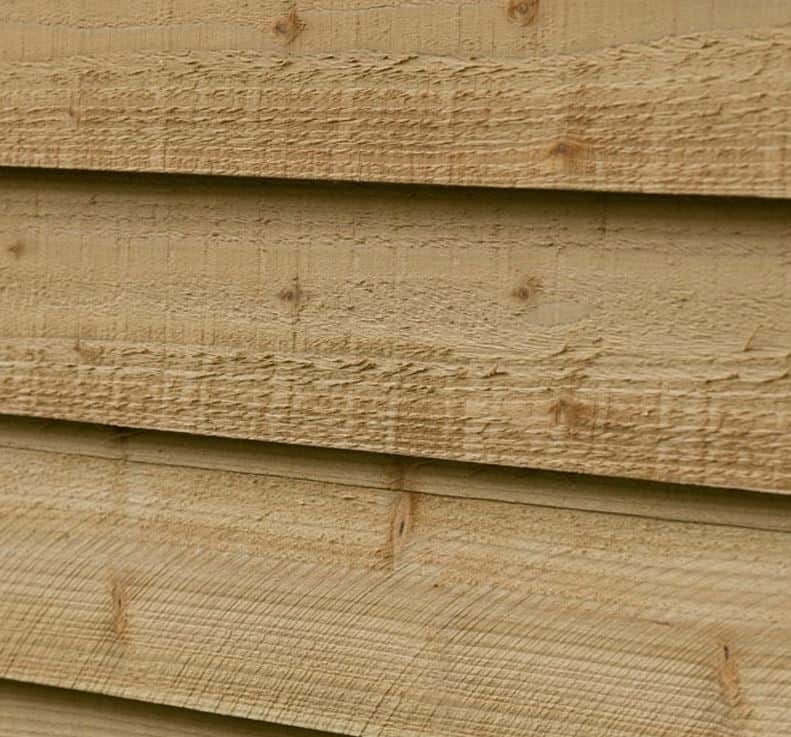 The pressure treatment used on the timbers, including the floor joists, gives long lasting protection against wet rot and dry rot, and the styrene glazing is also tough and resistant to impact. 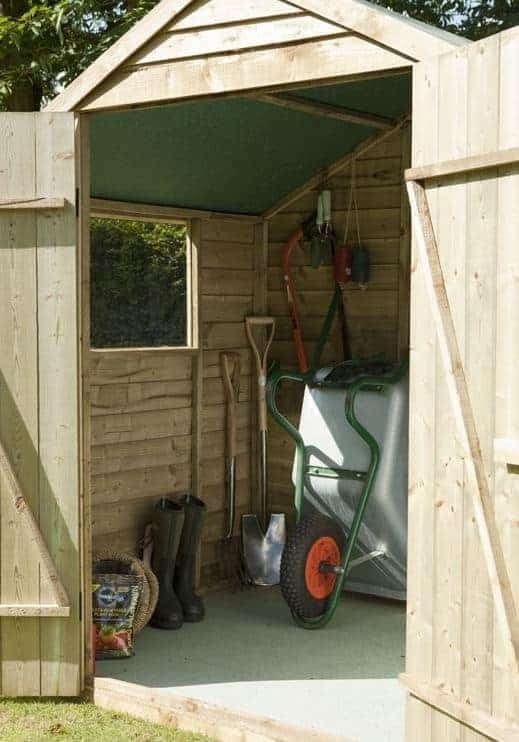 Whilst the shed has dimensions of 7’ X 5’ it actually offers more than that, thanks to the apex roof which gives extra storage space as well as extra room to stand up in and move around. 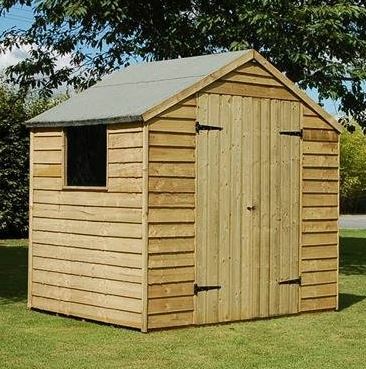 Due to its size, two people are required for the safe installation of this shed, but by following the clear instructions that come with the fittings this can still be accomplished quite speedily. 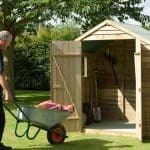 This shed provides excellent value for money, especially when you consider the flexibility that it offers thanks to the wide opening double doors. Final Thoughts: This shed certainly caught our eye while we were reviewing it, and it will do the same for your neighbours and friends as well. 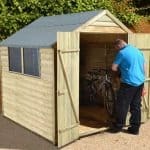 The design has a timelessly classic feel to it with the overlap cladding giving a rustic appeal, and yet the double doors make it suitable for storage of everything from ride on lawn mowers to motorbikes, and there’ll still be room for all your garden tools. A good strong padlock will be required, yet this doesn’t detract from the great value offered by this shed, especially considering that it’s backed by a 15 year manufacturer’s guarantee against rot.